Many improvement projects need the buy in of several people before they can progress. Amongst these people there will be some that have a firm view of what needs to happen and are keen to make progress. Some of the people won't be sure and they will need more time. Other people might not be that interested and have other priorities they want to focus on. It is an observation of mine and one that I see repeat on a regular basis with the businesses that I come into contact with. But, if we take the principle from the observation we have an interesting improvement strategy (one that I personally use when I get stuck with my client's improvement projects). 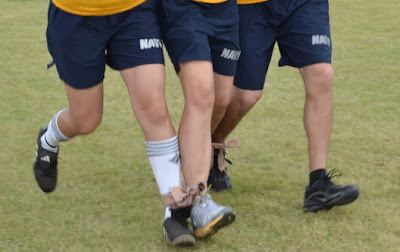 You might have worked out the approach from the title of this blog post, but it is analogous to a three-legged race (or four, five, nine...). If someone in the group moves in the wrong direction and / or at the wrong speed then the whole group falls over. In the example I gave at the start it is no different. You all move, or it falls apart. This isn't about being right, this is about being effective (and implementing changes that really make a difference to your business and its customers). What if you decided to become conscious about the pace of the people in the group? What if you figured out how you move your project step by step in a way that everyone buys in to each step in the journey? Could you slow down to speed up*? Every time I have had a project begin to stall I could see this pattern emerging. The people in the group were mentally starting to slip away from each other. The remedy was always the same simple approach. Slow down, agree the next step and not move forward again until everyone was 'super happy' with the current step. This can be repeated as much as required, depending on how often the group starts to stall. It's definitely not rocket science, but neither are most of the great ideas out there. Try it out if you think your projects need a different approach when they start to stall and see how you get on. * Yes, that is why my business is called 'Smartspeed'!